Unique additives make for an exciting beer variety. For the longest time, options were pretty narrow when it came to the types of fruit used in fruited beers. It seemed like raspberry and apricot were the primary selections, with blueberry sliding in at a close third. There's nothing wrong with these fruits, of course; their flavors are very complimentary in beers, which is why they're used so often. But we beer-loving humans crave diversity in our fermented grain obsession, and will go to extreme measures to make sure we achieve ultimate flavor satisfaction. This week, I looked to a couple of local beers that utilize less common fruits to keep your tongue and mind sharp and happy. 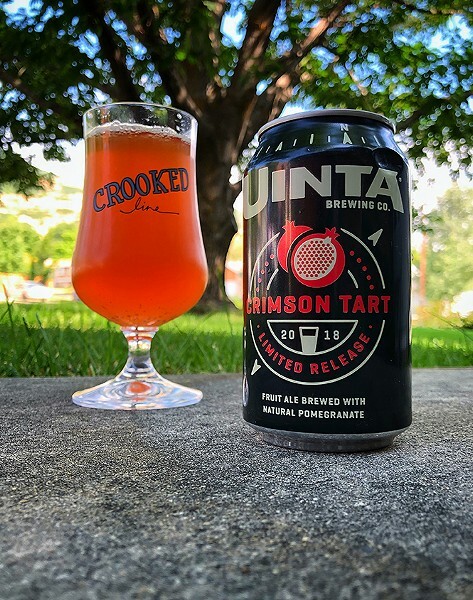 Uinta Crimson Tart: It pours a pink-hued golden/orange color with two fingers of fairly dense and fluffy light pink head. The aroma is full of pomegranate, lemon, lime, white grape and wheat crackers, with a great balance and complexity of fruity/acidic yeast. The taste begins with tart pomegranate, but soon transitions into other fruity notes like white grape, lemon, lime and a hint of green apple. Notes of straw and hay begin to build as lacto funk tartness emerges, adding a bit of earthiness mid-palate. Wheat from the base beer emerges in the end, adding a hint of malty sweetness. The finish has a good amount of fruity/lactic sourness and lingering tangy berry flavors. There's a great complexity of malt/sourness—fairly puckering, but with no lingering astringency. The 8 percent alcohol is noticeable, but far from warming. Overall: This is a great fruited Berliner weisse, featuring all-around good complexity and a solid balance of fruity/acidic yeast, pomegranate and a moderate amount of malt flavors. It's very smooth, crisp and refreshing, despite the high lactic acidity. 2 Row Orange Mango Sour: This brand-new offering from 2 Row Brewing pours a brilliantly clear golden-orange color that takes on more of an orange hue when held to the light. It has a slim white head that dies down to a thin ring that fades away. The nose starts off with a higher amount of sweetness, with the orange aspects taking the lead. It's somewhat reminiscent of marmalade, with some doughy bread notes underneath. As you let the aromas settle in, sweet mango becomes more apparent, rounding out the fruity bouquet. Once splashed on the tongue, you're met with higher amounts of medium orange sweetness that smacks the palate with as much intensity as the aroma. The mango, however, proves to be more assertive, as it soon takes over the more pithy flavors from the citrus. This is all followed by a high level of medium tartness. It finishes with some lingering tartness along with a Lemon Heads-esque candy taste—not too acidic and slightly crisp. Overall: This beer has nice drinkability, with good warm-weather benefits and a pleasant melange of fruit. The 6.4 percent alcohol adds zip, but is far from boozy. If you like tart fruit, you'll like this. Not all fruit beers work for everyone. I love strawberries, but have rarely found a strawberry beer that's worth a damn. Do yourselves a favor and seek out some of the state's odd fruited beers. See which ones work best for your palate. You might be surprised by the beer/fruit combo that puts you in your happy place. As always, cheers!